One year ago we learned that Brie Larson would be tackling the role of half-human, half-alien superhero Captain Marvel in the MCU. Larson was absent from this year's SDCC and likewise, we saw no trailer. Hey, it's not started filming yet! Marvel head Kevin Feige did the next best thing, however, and treated us to a slew of intriguing details about the movie. Ready for the big one? Captain Marvel is a 1990s-set MCU prequel. So it won't take place at some point after the events of Infinity War as we'd previously assumed. That means that as we're getting Nick Fury in the film, we're also getting a Nick Fury with 20/20 vision - yep, he'll have both of his peepers. 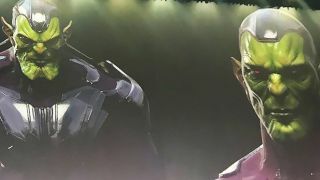 The most unexpected announcement came when Feige unveiled a load of concept art, showing off The Skrulls - the film's bad guys. They're an extraterrestrial humanoid race who have a huge intergalactic empire. Their presence is unexpected because Fox had the screen rights to those characters, as they're tied into the Fantastic 4 property. Clearly Marvel's brokered a few deals other than the Spider-Man one with Sony. Don't know about you but I can't wait to see her crush some more Skrulls.